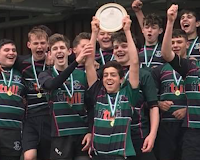 ...this time to my son's Under 15 team who on Sunday completed a magnificent season by winning the County Plate, triumphing 31-22 in a tense and hugely physical final which could easily have gone the other way. In mid-March I commented on the boys' incredible unbeaten run which had stretched to 21 matches from midway through last season. 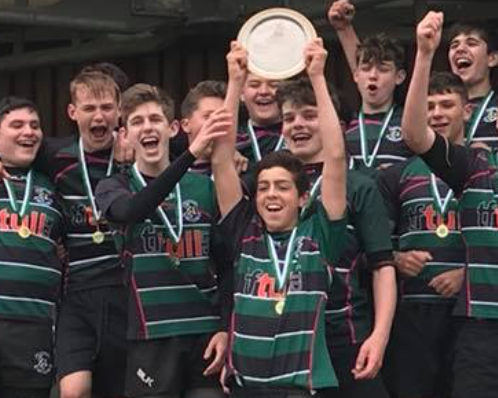 Unfortunately a combination of the Easter holidays, appalling weather and sod's law then intervened and the team lost its very next game, letting the league title (although, fortunately, not promotion) slip from its grasp. That was two weeks ago, and so Sunday's match was all the more important if the boys were to have their fantastic season rewarded with something tangible. And, although by no means their best performance of the season, the team really dug deep to see off determined and feisty opposition who at one point came from 17 points down to close the gap to just 2. My son ended up bruised and battered but happy. And I couldn't have been prouder.